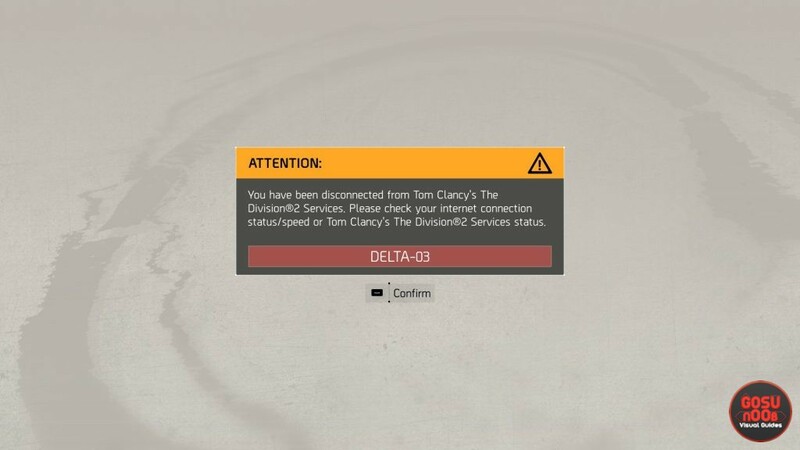 The Division 2 private beta is off to a rocky start, as betas often are. Most people are playing without any issues, but a number of players are reporting various problems, ranging from their accounts being banned, to getting a black screen upon starting the game. Some of these errors you can skirt around, but others require action from the developers’ side. This guide will show you a list of all The Division 2 beta errors & problems, how to solve or avoid them when possible. These error codes are all related to connectivity issues. Some of them will disconnect you from the servers, others won’t let you join them in the first place. What they all have in common is that you won’t be able to do much about them. You can whitelist the game’s .exe file in your firewall and antivirus (if you’re on PC), but it’s almost certainly due to the wonky servers. Be patient, and all will be resolved. There was earlier an issue with erroneous account bans when starting the game. It seems to have been patched quickly. If you were affected by this, try restarting your PC. If that doesn’t help, shoot an email to Ubisoft’s support. There have been reports of people getting a black screen upon launch. This seems to be caused by the game’s overzealous anti-cheat. Turning off all the software that has an overlay can help – OBS, Rivatuner, MSI Afterburner. You should also update your GPU drivers, if you haven’t already. If neither help, there’s a config file edit you could try. Find the file state.cfg in C:\Users\your-username\Documents\My Games\Tom Clancy’s The Division 2\, then open it up in Notepad. Find the lines for “dx12”, “fullscreen” and “maximized”, and set them all to true. A number of people have been complaining about an audio issue where there’s no sound during dialogues, and the subtitles appear only for a split second. Turning off spatial sound in the settings seems to have helped some, but there’s no guarantee. We’ll just have to wait for the devs to fix it. If you still haven’t received your beta code or email, there are several things you could do. If you’re supposed to get the code from a friend, go here and click on redeem code, then verify email. It’s poorly worded, but that’s how you get it. If you’ve preordered the game on console and are waiting for an email with a code, you should log onto Uplay and check the betas section manually. The code will be there, even if you haven’t received the email. I’m getting an Oscar 03 error when trying to download a patch at the beginning of the game. Won’t let me pay it. It says connectivity issues, but I checked my connection and everything is fine. Please help. * delayed audio when firing gun. * NPC’s continually convulsing on the floor after being killed. * DC’ing back to main menu…. a lot (this seems to be resolved now). All in all a very smooth closed beta.